PSYDEH looks to hire our first Sustainability Coordinator by the 3rd quarter of 2019. 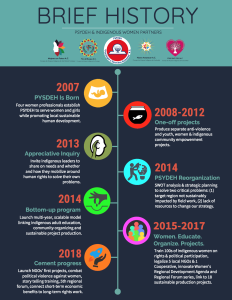 As background, PSYDEH was founded in 2007 by four women professionals to serve Mexican citizens while promoting local sustainable human development. Seven years later, we evolved our strategic foundation, e.g., mission, vision, values and strategic process-oriented directions with the goal of becoming a sustainable enterprise crafting a scalable model to make a lasting social impact. Evidenced by our most recent Annual Report, recent project promo films, and our new animated lesson in Spanish and English explaining our program in action, we’ve made strong progress over the last four years. Now, to consolidate progress, we pursue the funds to hire a full-time staff person who helps PSYDEH diversify income streams, a key to sustaining our organization’s work. PYSDEH’s Sustainability Coordinator will focus on three important income streams: national and global crowdfunding, social capital-and fundraising event production and corporate sponsorship. (1) CROWDFUNDING: Leverage PSYDEH’s top 10+5 NGOs committed to sustained impact status in US-based GlobalGiving’s network, and new digital communications learning from our 2018 collaboration with the global Dentsu Aegis Network when directing global and national crowdfunding campaigns. (2) SOCIAL CAPITAL: Continue producing social capital and fundraising events in Mexico City, sharing experiences and resources needed to continue making progress towards our respective missions. (3) CORPORATE SPONSORSHIP: Negotiate a win-win collaboration with a Mexican national or global corporate partner with whom PSYDEH shares experiences, technical support, and resources. PSYDEH is excited about this 2019 investment in organizational sustainability, and our anticipated enhanced capacity to make a sustained social impact.